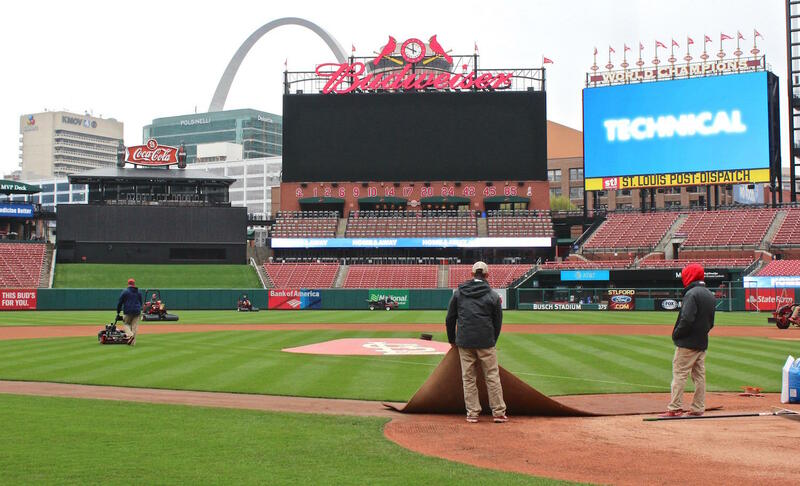 The grounds crew prepares the field at Busch Stadium for the Cardinals home opener in 2017. Though Thursday’s gloomy weather meant that Cardinals fans will have to wait another day to see the team play the season’s first game at Busch Stadium, Goold said that the St. Louis faithful should have a lot to look forward to this season. One reason to be optimistic, Goold said, is how upbeat veteran catcher Yadier Molina has been in the lead up to the opener. “He has a read on teams, and often he wears his fondness for his team and for the team's chances on his sleeve. He wants to play on a contender and he wants to get a team back to October. He's bothered by their absence,” he added. Goold also spent the last year editing, updating and revising his book on Cardinals history, “100 Things Cardinals Fans Should Do and Know before They Die.” The newest version of the book includes obscure tidbits from the team’s history, such as the 1886 “ghost” championship and the urban legend of Enos Slaughter being buried in his Cardinals jersey. Goold said that revisiting the book allowed him to not only retell and expand on the stories that he had covered as a reporter, but also the stories he heard from his grandfather, a lifelong Cardinals fan.